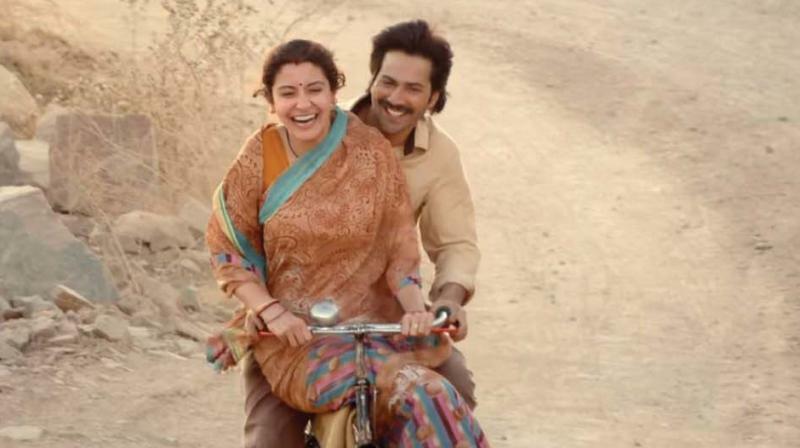 Sui Dhaaga movie review: A stitch in time saves no one! The movie sees Varun and Anushka, as the simple husband and wife, trying to become professional partners from life partners. A still from the movie Sui Dhaaga. Varun Dhawan and Anushka Sharma have been paired for the first time in ‘Sui Dhaaga: Made In India’ which is helmed by ‘Dum Laga Ke Haisha’ director Sharat Katariya. These two reasons were strong enough to watch the movie, but have any of them done justice to the film? The movie sees Varun and Anushka, as the simple husband and wife, trying to become professional partners from life partners. Varun Dhawan alias Mauji is one confused man, and certainly not a decision maker. His wife Anushka aka Mamta positions herself as his strongest support – wants him to start his own business – but ends up crying at every instance. Mauji and Mamta are a tailor couple, and misfortune’s favourite children. Mauji leaves a job as his boss shoved him around. Mamta wants to see her husband an achiever and the family happy. But in her personal space, she remains the most obsequious wife ever. A little jarring if we look at women on the screen in the theatres around her. She is smart but unabmotious, having hitched her wagon to her husband’s struggling star. It is certainly not a character Anushka has played before. They wish to get out of this by participating in a stitching competition. The rest, literally, is ‘Happy New Year’ history. Anyway, the story turns more predictable as the movie progresses. One was at least expecting a lifter in the climax. But we only get weepy and preachy. We have seen Varun play the common man in ‘Judwaa 2’ and even in his last release ‘October’. We can accept him as that a third time. He is also interesting at times as the quintessential entertainer. But Sharma really struggles. There is not one moment when she can infuse life into her character. She is just forced. The supporting characters take the lead in this movie. Raghubir Yadav as Mauji’s father and his on-screen wife played by Yamini Das, are stellar. Namit Das is full of beans as the anti-hero. Anu Malik’s music soothes and even lifts up certain scenes. And the clothes that Mauji stitches – for his mom or for the competition – are very chic. Director Sharat Kataria made ‘Dum Laga Ke Haisha’, and we expected a redux. But ‘Sui Dhaaga’ was not that film. Watch the film only if you have absolutely nothing else to do over the weekend, and don’t go with any expectation. We’d say watch in on TV. Whenever, that is.